In 1952, Jeevanpran Shree Muktajeevan Swamibapa first reached Panchmahal for the benefit of all the people living in the region. To start the festival being held to mark the 60th anniversary of this occassion, a parade was held from the centre of Vaghjipur to the Mandir. This was the exact route taken by Jeevanpran Swamibapa when He first arrived in the village. At that time, He too arrived on foot. Acharya Swamishree was welcomed by senior sants and the regional dignitories.Fresh fruit was donated to all the children of the region by Maninagar Shree Swaminarayan Gadi Sansthan. As a gesture, a few young children came to accept the donation on everyone's behalf. 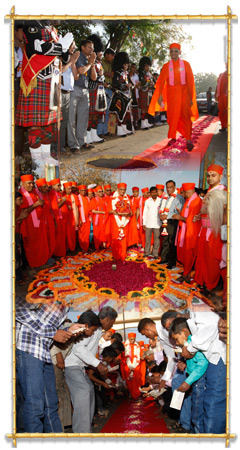 As Acharya Swamishree walked along the red carpet decorated with red rose petals, disciples placed donations for the charitable work of the Organisation. This continued for the entire duration of the 2 kilometre walk. Led by Shree Muktajeevan Pipe Band performing patriotic and devotional melodies, the charity walk lasted over 2 hours. At the assembly marque held in the grounds of Shree Muktajeevan Swamibapa Arts College, all the participants of the charity walk sat down to listen to the divine blessings of Jeevanpran Swamibapa given in Vaghjipur 40 years ago. Acharya Swamishree inaugurated a new kirtan CD 'Madhuri Murti Bapani'. The compilation includes kirtans composed by Sadguru Shastri Shree Sarveshwardasji Swami. People from all over the world have come here to Vaghjipur, but many more have been unable to be here due to their own circumstances. We pray to Lord Swaminarayanbapa Swamibapa that all those disciples too gain the divine blessings that will be given during this grand festival. Today marks the first day of the festival being held on the 60th anniversary of when Jeevanpran Shree Muktajeevan Swamibapa first set foot onto the poverty-stricken soil of Panchmahal. His aim was to instill spirituality into the people and free them from false superstition and addictions. Due to the divine grace of Lord Swaminarayanbapa Swamibapa, the lives of many thousands have been transformed. In all respects, the lives of countless families have progressed in all respects. This festival is being held by the disciples of Panchmahal to demonstrate their devotion to Jeevanpran Swamibapa and Maninagar Shree Swaminarayan Gadi Sansthan. This morning, we followed the path taken by Jeevanpran Swamibapa when He first arrived here. We should remember the pains that He endured to relieve our suffering; all that He tolerated for our welfare. During the Padarpan Smruti Walk, disciples showed their demonstration towards the Lord; everyone has just one wish, and that is to please the Lord. Everyone wishes that their name gets added to the Lord divine register, and that the ‘bank balance’ written against their name on that register is added to and made more secure. The benefit of being on the Lord’s register may not be apparent today, but rest assured that all your deeds to please the Lord are being recorded and when the time comes, your efforts will yield great rewards. Then, you will see the benefit of performing selfless services at Shree Swaminarayan Gadi. Many different kinds of people have come to this festival. During your life too, you will encounter many different types of people. You should recognize who will assist you in your progression towards God, and who will lead to your decline. You must also recognize the traits within yourself that will lead to your degeneration and eventual fall from the path of God. You must maintain dedication, respect and admiration for the commands of God, however small they may appear to you. Ensure that your life truly blossoms, just like a beautiful, fragrant lotus flower. The first step in this process is to remove the arrogance and ego within yourself. Each day, recognize your own inferiority before the Lord, and at the same time, appreciate more and more the unsurpassed greatness of Lord Swaminarayanbapa Swamibapa and Shree Swaminarayan Gadi. After Acharya Swamishree’s divine blessings, some of the benefactors of the scripture recitals received mementos to remember this special occasion. During the evening session, a concert of devotional songs, performed in the traditional style of the Panchmahal region was held. Vikram Thakor and Bhikhudan Gadhvi, 2 of the most famous and popular singers and dancers of the region, sang to a crowd of over 50,000 people. The event was made even more special by Acharya Swamishree coming onto the stage to dance with these popular artists.